It's almost time to put the seedlings in the garden, and if you're like me you started some of them weeks ago. I'm pretty cheap when it comes to a lot of things and seed starting is no different. Now, I know I'm not the first one to use old plastic containers to start seeds in. Not only is it a common idea, but it's so very practical. 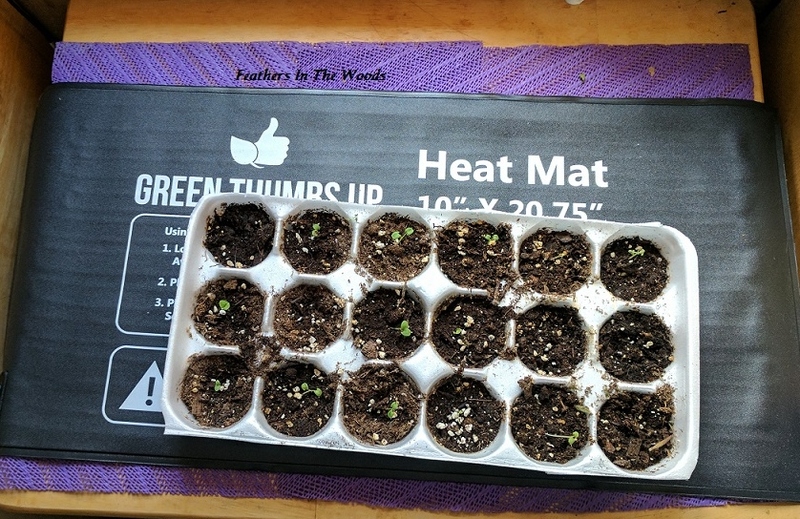 Have you ever seen the prices on seed starting trays? They can go from $1 up to $15 each! That's just crazy if you ask me, especially since we throw away so many perfectly usable plastic containers all the time. I'm not trying to reinvent the wheel here, but I did want to show you 2 of my favorite containers. First is the yogurt containers. My daughter and I are huge yogurt eaters and with the most recent coupons and sales I have gotten a ton of Yopa yogurt lately. I love these ones because they have their own individual lids and really do look like mini greenhouses. We have been buying both sizes which makes it nice for starting different types of seeds....and they fit easily on any size window sill. Second up includes a confession. I have a bit of a Sam's club Red Velvet cupcake addiction! The 4 large compartments on these cupcake containers make it great to start cluster type seeds like watermelon or cucumber. I put 3 or 4 in the middle of each section and there is plenty of room for the whole grouping to grow! like to use egg cartons for herbs. One of these takes up a whole lot less space the 18 individual pots. It saves a lot of space on the heat mat! They can grow a few weeks before you need to transplant them to a larger pot. I also use empty K-cups as mini seedling pots. I also use mushroom containers and take out and microwave food containers...pretty much anything plastic and somewhat bowl shaped. Dole fruit bowls are some of my favorites as are Styrofoam soup cups. Take a look around and see what you have on hand. I'm sure you can come up with something to reuse instead of throw out! Love your repurposing! We also use eggshells, toilet paper rolls and tin cans. I recently did a post on this topic. Best wishes with your seedlings! I saw the eggshell idea! I might try that for herbs. Thanks! Great ideas! I used newspaper pots for the first time this year and really like them, much more than toilet paper roll which fell apart on me. Thanks for joining The Creative HomeAcre Blog Hop. Hope to see you again this Sunday!